Online marketing is a necessity in today’s electronic world. iBec Creative, based in Portland, is a social media and ecommerce company with the expertise and technology to build websites designed to encourage more traffic and sell more online. Run by Becky McKinnell, the company has been in existence since 2006, after McKinnell graduated from the University of Southern Maine with a degree in art and entrepreneurial studies. “We focus on ecommerce business for anyone who sells something online if they have a brick and mortar store or not,” said McKinnell. Clients can sell business to business or sell to the general public. iBec can make sure that what a business is doing and how items are being offered is the most effective use of marketing dollars, from the website design and coding to the digital marketing. The team of 12 at iBec is ready to take businesses to the next level, whether someone is opening a new venture or wants to expand to lucrative online ecommerce. iBed can create a store that is open 24/7/ 365. “You never get to the perfect state. It’s a constant adventure,” McKinnell said. “It’s all about measurement, what users are doing and how our clients can continually optimize their site.” iBec has the tools to monitor and analyze the data they receive from the advertising and marketing on social media. iBec does not deal with other forms of advertising and encourages business owners to continue to advertise, but to find a way to be able to track the calls coming from the advertising source or have a call to action like - “Schedule your test drive”. Most business owners don’t have the skills or the time to be bothered with keeping an eye on their social media accounts or measuring what advertising works best, iBec takes on that important role in a business. They can create inventory management tools and can help make shipping things across the country easier. The first thing iBec does is evaluate an existing website to improve on what is happening there. They will check to make sure the shopping cart is responsive and that the site is mobile and tablet friendly. They also can check to see if they can improve the site for ecommerce. Some of their clients include Day’s Jewelers, FHC and Black Point Lobster- who ships gourmet food all over the country. Some of the social media controls for platforms like Google AdWords, can be set up by the client, however they have to be careful not to spend money on negative keywords that don’t fit with the concept of the business and products. iBec can update websites and make sure that once the process is complete that all modules and plugins are still working correctly on the site. Clients can meet at the iBec office, 100 Fore Street in Portland, for a discovery meeting to discuss what the client wants for his or her business. 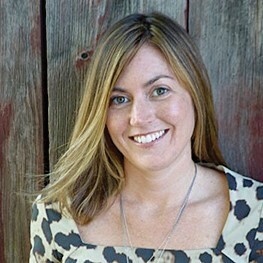 “It’s nice for clients to get out of their office and not be distracted. We also provide food,” McKinnell said. Clients pay for time the company works on a project, but the client continues to pay directly to the social media platforms they advertise on, McKinnell said. 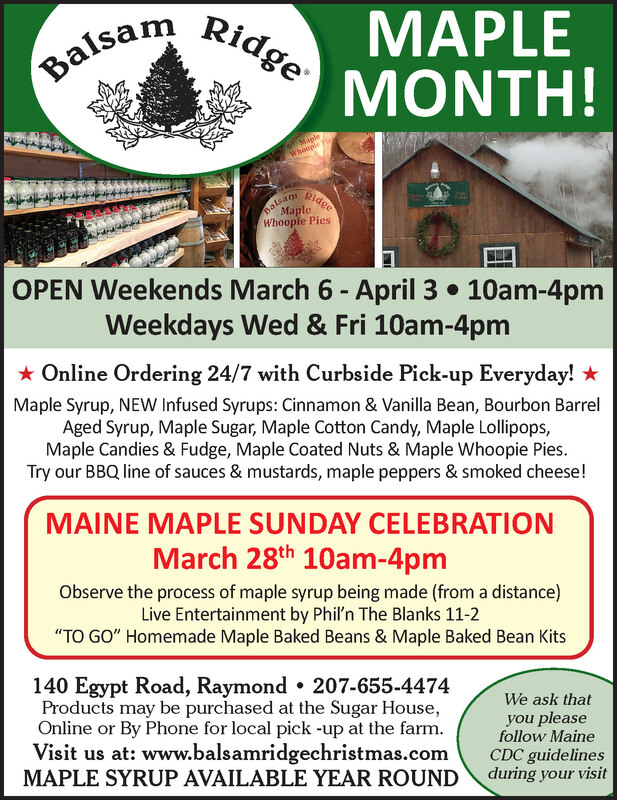 Balsam Ridge Farm is gearing up for this year’s Maine’s Maple Weekend, this Saturday and Sunday - March 25th and 26th. Located on Egypt Road in Raymond, Balsam Ridge is a family owned farm that started as a Christmas tree farm in 1993 when Dewey and Sharon Lloy bought the property. They cleared the land for the farm before even building their home, Sharon said. The business started as a hobby, but became a year round operation with the syrup production and over 10,000 Christmas trees. Dewey had an aunt and uncle who owned a tree farm, so the Lloys had been exposed to the business. Coming from South Portland, the couple and their three children longed for more space. Each season there is always something that must be accomplished, from new tree plantings, to hand trimming each tree, to making maple syrup. “We hand sheer each tree based on the characteristics of the tree. Like people, they come in all shapes and sizes,” said Sharon. In the late winter/early spring, sap starts running from the over 1,000 taps on the property. The sap runs through tubes into the pump house, which then pumps the sap into the sugar house. Seventy percent of the syrup is made by Sharon in the oil burning evaporator. With a young family when they first started, she offered to take the helm if it was automated. Dewey made that happen and she was able to run a household, take care of the kids and their needs, as well as produce close to 300 gallons of syrup each year. “That satisfied the needs of the farm,” Sharon said. The farm now offers online sales and shipping for those who can’t make it to Raymond. Customers come from all over to visit the farm and return year after year for their supply of Maine syrup. “Families come from all over - Massachusetts, Connecticut and beyond. They come for skiing and visiting family. We have a following,” she said. Education has been important at the farm. Watching and learning how sap is boiled down into syrup brings back childhood memories. Most people remember when they made syrup with their grandparents and that they did something to help out. “It brings them back to childhood,” Sharon said. “People are always amazed at the amount of sap it takes to make a gallon of syrup.” It’s said that 40 gallons of sap make 1 gallon of syrup, but at times it takes a little more sap to make it the right consistency, Sharon said. This year Balsam Ridge is bringing back its popular Pancake Breakfast from 9 a.m. to 2 p.m. on Saturday and Sunday. The Raymond Lions Club will run the breakfast and all the proceeds will go to them to help support their programs in the community. In addition to the pancakes, there will be demonstrations of tree tapping at 11 a.m. and 2 p.m., and if the pancakes weren’t enough food, there will be hot dogs cooked in sap and homemade maple baked beans from 12 p.m. to 4 p.m. At 1 p.m. visitors can try taffy on snow, which is when heated syrup is poured over snow and it turns into taffy. They will also have maple syrup over ice cream, a Maine’s Maple Weekend staple. On Sunday, there will be live entertainment featuring Red Beans & Rice from 11 a.m. to 2 p.m. All weekend there are self-guided tours and the Sugar House and Gift Shop will be opened for all maple needs - including homemade confections such as maple whoopie pies, maple cotton candy and more. People are also encouraged to snow shoe through the Christmas trees if conditions are right. March has always been Maple Month at Balsam Ridge. Don’t miss out on the fun. 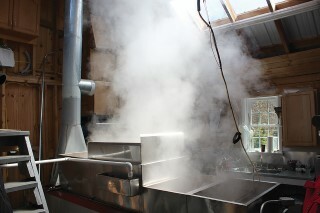 For more information on the farm or to purchase syrup and other goods online, visit: www.BalsamRidgeChristmas.com or visit them on Facebook to find out when they are boiling sap for a drop in visit by appointment. Changes in tax rules, much like the stock market, can be unpredictable, so how can you anticipate your tax bill in retirement? Having some tax diversification with your accounts may help you counter the ever-changing tax environment and provide you with some flexibility when you retire. If you’re a younger investor or in a lower tax bracket, a traditional IRA’s tax deduction or a pretax deferral into an employer plan may be less important, making a Roth IRA potentially more beneficial. If you have the majority of your retirement savings in a traditional IRA or 401(k) account and can forgo the current tax deduction, consider shifting some of your contributions to a Roth account. If you have fewer contribution years remaining, converting a portion of retirement assets to a Roth may increase tax diversification and flexibility in retirement (but may also cause a current taxable event). To most people, how they look to others is important, but how a person feels about him or herself is even more crucial. At Roots Hair Studio and Spa, the goal of the stylists is to make sure everyone who leaves the salon feels better than when they arrived. “We want to give you the best look that’s going to suit you - and we listen,” said stylist Shelley Worthing. 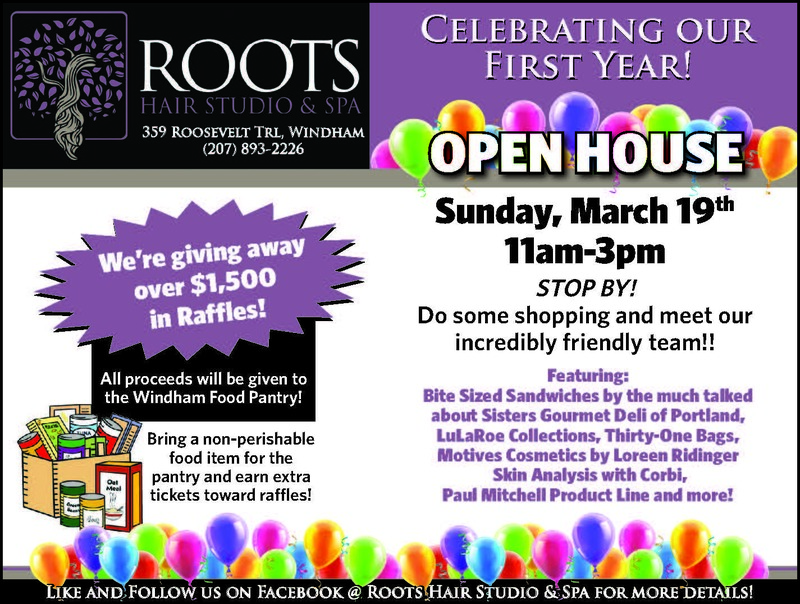 Stylists at Roots Hair Studio and Spa have a year under their belt in their space at 359 Roosevelt Trail in Windham. However, the four ladies have a combined 78 years of experience doing hair, makeup and more. “We’re super excited to be a year old. We’d like to see new faces and for them to see what we have to offer,” Worthing said. There will be an Open House at the salon on Sunday for those who would like to meet the stylists. “We’re fun and exciting,” said stylist Natalee Taylor. The name Roots came together organically. Owner and stylist Rae Ann Tourigny and Worthing took over part of the building that used to be a pottery store on Route 302; they remodeled and laid down “Roots”. For Worthing it was also coming back to her “roots” as the building sits on land that once belonged to her grandfather Clifford Morrell. The stylists at Roots stay on their toes with trainings and make sure they know the trends and styles people want. They aren’t doing as many perms, but they are ready to help clients with whatever look they are going for; a pop of fashionable color or balayage, where the color is melted on together to blend from dark to light. Worthing said it’s more natural and has less maintenance. Many people are opting for long hair with waves for more movement, but it boils down to what looks best on the client. “Everyone says it, but we really have the best clients,” said Taylor, who also does OPI shellac manicures and is a LuLaRoe stylist. She holds bi-monthly Open Houses at the salon and does private bookings upon request. Custom is a way of life at Roots. The stylists are looking for ways to help clients express their individuality. Roots is an official Paul Mitchell salon, using those products exclusively, offering shampoo, conditioner and hair color products in a variety of shades and colors. The salon offers Motives Cosmetics, which is a custom blended foundation, based on skin tone and type - be it oily or dry. There is a perfect formula for everyone. “We offer a custom blended mineral powder foundation and liquid foundations. No other make up line has that,” said Worthing. Corbi Duquette does facials in addition to hair. She uses Pevonia Botanica products to pamper her clients in a private room in the salon. “We really appreciate them walking through our doors and for taking the time to choose us,” said Worthing. Appointments are recommended and available upon request per stylist. Walk-ins are welcome, but to serve clients better they should call first. Hours vary by stylist, but someone is generally in the salon from 9 a.m. to 7 p.m.
To make an appointment call: 207-893-2226 and follow Roots Hair Studio and Spa on Facebook. When it comes to indoor or outdoor gardening and cultivation, High Wire Hydroponics in Raymond has the tools and knowledge to help the beginner to the advanced gardener succeed. Owners Sean Heggarty, Adam Nappi and Jeff Buckley opened the store at 1 Murray Drive, off Route 302, in 2014. Since that time they have outgrown their current location and have plans to open another store on Murray Drive. “All of us have been medical marijuana card carriers before the law to keep a foothold in the market that’s going to explode,” said Heggarty. In the store, they have indoor and outdoor growing equipment and all the free advice a person could need, Heggarty said. From soil to plant food, oxygen and plant pots, there are many options for growing plants at High Wire Hydroponics. Most of the people coming and going from the store are repeat customers and the owners welcome them by name. If there is an item a customer needs and it’s not in the store, the staff can order the items from their distributers. “We are very customer oriented,” said Heggarty. “Come in, chill.” They also offer customer appreciation parties and VIP parties to keep relationships tight. Hire Wire delivers pallets of soil and are grow consultants. They lend a hand whenever needed. In the future space, the owners plan to hold classes for medical marijuana providers, or those who want to learn to grow marijuana or other plants using hydroponics. They plan to offer classes in good soil cultivation, general gardening and more. From novice to expert growers, High Wire has the right supplies to get gardens to thrive. The store carries a large variety of plant food. “It’s a nice alternative to Miracle Grow,” Heggarty said. “We have better prices than a nursery and more variety for sure.” They offer many different brand lines to offer customers a vast choice of products. “The people who do best with hydroponics are those who are meticulous, take good notes and are detail-oriented. The system has to be checked often. If a pump dies, within two hours the plants will die”, he said. Maine law that went into effect January 30, 2017 - “Allows persons over 21 years to grow six mature plants and possess 2.5 ounces.” The other part of the law allows retail sale and taxation of marijuana has a legislature approved moratorium in effect. “It’s a huge part of the culture up here, if you’re willing to admit it or not,” he said. Heggarty expects to see an increase in business in spring and summer, as people try their hands at growing outside their houses. Outside gardening balances the cost and ease of use against the technical side of hydroponics for those who want to be “dialed in” to their plants. “We’re here to help. There’s a huge uptick of new growers we can help from start to finish,” Heggarty said. Heggarty has a degree in environmental policy and planning and has had a few other businesses before opening High Wire Hydroponics. The owners just closed on a parcel of land next to their building where they plan to create a disk golf course. They already sell the disks and other equipment in the store, so they saw this as an opportunity. It should be finished in the fall, Heggarty said. “We’re young, we might as well go for it,” Heggarty explained about expanding the business. The store is open seven days a week from 10 a.m. to 7 p.m. Monday through Friday and 10 a.m. to 5 p.m. on Saturdays and Sundays. For more information visit: www.highwirehydroponics.com or visit them on Facebook, Twitter and Instagram or call: 207-655-2072, or email: info@highwirehydroponics.com. Dirfy Generators has been keeping the lights on when the power goes out for more than 8 years. Owner Bob Cyr has been installing generators since 1982. Back then, he was an electrician who specialized in generators, but now the company services, installs, inspects and sells generators exclusively. Recently they were awarded the title of, Briggs & Stratton Standby Power Top Dealer for 2016. Based at 184 Ossipee Trail in Limington, Dirfy Generators business took off three years ago. The industry exploded and Cyr decided to ride the wave with his son Robert, who earned his associate’s degree in electrical technology, by his side. Standby generators work when the power goes out. They start and power multiple vital things in the home; perhaps a refrigerator, the furnace, a sump pump and a few lights. Dirfy Generators has an ongoing inventory of generators and spare parts to help service customers quickly and efficiently. Other dealers also buy from them. “If we have to order a part, customers get five percent off the part except engines and alternators,” said Cyr. “Everybody has their reasons for having a generator like peace of mind; some have sump pumps and refrigerators they need to run. A lot of people use it for CPAP or oxygen machines. Although none of the generators are designed for life support,” Cyr said. Dirfy Generators sells Generac, Kohler, Briggs & Stratton, GE and Champion. Ninety percent of the generators sold are Briggs & Stratton, primarily because they have the best warranty on the market, Cyr said. Straight out of the box, everything is covered for six years. Another benefit for Briggs & Stratton is that it has a good power management system which protects the generator and extends its life. It monitors what a home is using and what each load is and it knows if it has power available. If it doesn’t, it won’t send the power. Other generators have what’s called a load setting, which will power as much as the homeowner wants; but it might put too much strain on the generator, if it is over used. Dirfy Generators offers free evaluations. A customer representative tours a house to evaluate it and then will ask for a wish list and needs list, to determine which size generator is best for a customer’s desires. Generators run on propane or natural gas. Even if a client doesn’t readily have access to one of those, Dirfy can put a customer in contact with a dealer. Customers are generally within a two hour drive of Limington from Augusta to York in Maine and New Hampshire. The busy generator season is from August to February and Dirfy Generators, who stands for “doing it right for you”, has put in hundreds and hundreds of generators over the years. They also pick up 60 to 70 new customers every year who formerly worked with other dealers. This is a testament to their reputation.